Little bare feet. 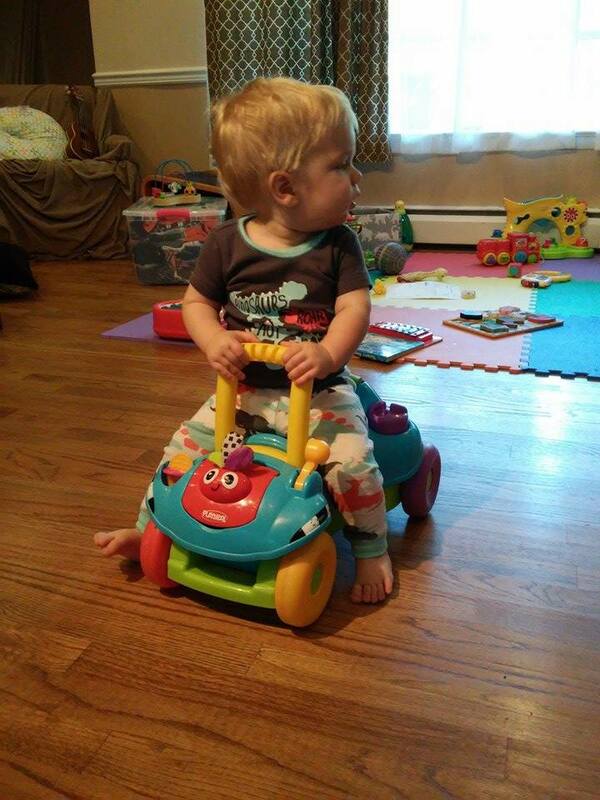 Five tiny toes on either side, flexing and wiggling to hold him upright as he bounces on the seat of the Fisher-Price ride-on toy. His diaper crinkles under his dinosaur jammies. Bounce bounce, crinkle. Glancing behind him, checking his blind spots like a teenager training for his license, he pushes off and moves backwards half an inch. And again. And again. Shove, shove, shove, one foot stronger than the other, bringing him in a wide circle. He looks up for approval as he inches away from me, and I smile. Good work! Keep going! He looks down at his feet and shoves again, and grins, and yells. He leans over the handlebar and pulls at the lid to the trunk, and I see he’s packed for his trip. Two plastic spoons and a wooden sheep. I stand behind him and lean down. All the way down, almost to the floor. One arm on either side of him, my hands beside his on the handlebar, hugging him safely in place. Ready? Are you ready? His feet kick. He crinkles and bounces. One… two… threeeee! I draw the count into a wheeee as I scoot him forward across the hardwood, and he pulls up his feet, and both his eyes and his little mouth open wide in silent joy. I know this because he turns halfway back so he can see me while we zoom away. It doesn’t matter where we’re going. He’s with Mommy. This entry was posted in Life and Family, Writing and tagged kiddo, moments on August 29, 2015 by antijen.